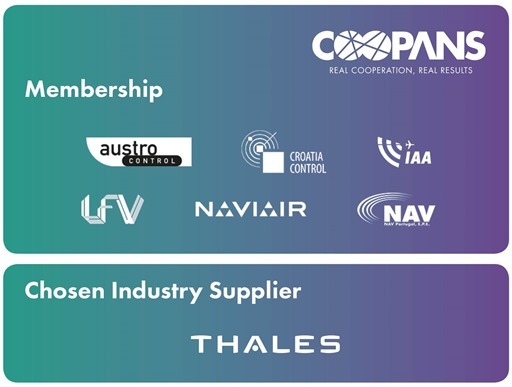 COOPANS is an international successful partnership between the air navigation service providers of Austria (Austro Control), Croatia (Croatia Control), Denmark (Naviair), Ireland (Irish Aviation Authority), Portugal (NAV Portugal) and Sweden (LFV). Thales is a chosen supplier (industry partner) for COOPANS. > Download leaflet "COOPANS, REAL COOPERATION, REAL RESULTS"
COOPANS partners operate a world class, safe and cost-effective ATM system. COOPANS has adopted a common managerial approach, whereby the six ANSPs act as one organisation together with Thales with a focus on common success. The harmonisation of functionalities and joint investments enable the implementation of an advanced and unified air traffic control system. COOPANS has structured the development and deployment process around joint activities such as common specification, operational documentation, validation, training materials and generic safety cases. COOPANS is the golden example for co-operation and harmonisation in Europe. The COOPANS Alliance capitalises on joint, innovative and harmonised system development between COOPANS Alliance members through industry partnership, and positively influencing the European environment to operate a world class, safe and cost-effective ATM system, delivering efficient service to customers. Industrial partnership: COOPANS partners operate a world class, safe and cost-effective ATM system and is the leading example in Europe of an industrial partnership. ANSPs ’act as one’: COOPANS has adopted a common managerial approach, whereby the six ANSPs act as one organisation together with Thales with a focus on common success. Continuous system upgrades - Avoid big-bang to minimise risks: COOPANS have adopted an approach of continuous system upgrades to reduce risks and to avoid peaks in capital expenditure programmes. Common platform and harmonised deployment: COOPANS has now implemented the same software build at all 7 Area Control Centres (ACC), across 5 ANSP members. The harmonisation of functionalities and joint investments enable the implementation of an advanced and unified air traffic control system. COOPANS has structured the development and deployment process around joint activities such as common specification, operational documentation, validation, training materials and generic safety cases. Leading edge technology: The COOPANS ATM system uses leading edge technology. All partners are now running CPDLC and MTCD safety nets, have the same integration platform and undertake common validation and planning The system fulfils the operational needs of the ANSPs, including significantly increasing capacity and the ability to handle increases in traffic without any delays. Controllers are working on a very stable basis, with the COOPANS system functioning consistently well. Lower cost - Deliver Value for Money by sharing costs: The COOPANS system minimises costs to its customers (airspace users) by keeping system costs down and saving ANSPs time. The common platform significantly reduces the integration and deployment costs. A 2012 Value for Money (VfM) study concluded that the COOPANS business model typically achieves 30% development costs savings compared to a standalone model. Meeting SES Requirements: The roadmap for COOPANS ensure that the ANSPs meet all Single European Sky requirements.